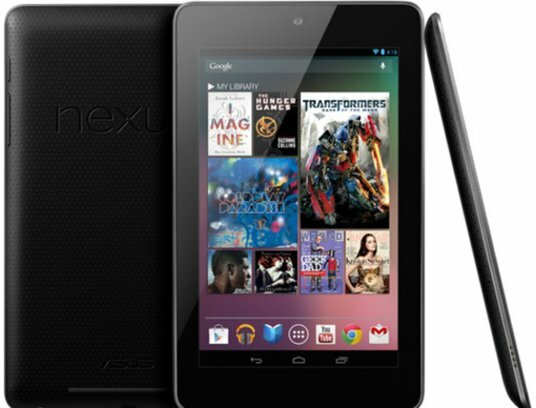 iSuppli has just released the estimated BOM for the Google Nexus 7 tablet, after a complete teardown. The estimated BOM cost of $152 is below what other firms had estimated before analyzing the hardware. This estimate essentially guarantees that Google & Asus will at least break-even on sales of the 8GB model and make a modest profit on the 16GB model. Let's take a look at the gross margins for the Nexus 7, in comparison with the Kindle Fire, and the implications on the iPad Mini's estimated margins. Based on these estimates, the Nexus 7 has a modest gross margin of 20% on the 8GB model and an acceptable margin of 33% on the 16GB version. The Kindle Fire's current BOM costs, in the meanwhile, give it a gross margin of around 30%. Keep in mind that these costs are exclusive of marketing, distribution & promotional expenses. These gross margins would ensure that Google & Asus would not make a loss on the 8GB model. Also, given the price points, it is quite likely that the 16GB model may prove to be more popular. The modest profits on the 16GB model should prove worthwhile, given the Nexus 7's larger goal of making Android relevant in the tablet market. The margins on each model are also the primary reason why Google is exclusively selling the 8GB model on the Google Play Store, while the 16GB model is also available in stores. Since online sales model has lower associated distribution costs, Google & Asus can be assured of turning a profit on the 8GB model. I have already written about the rumored iPad Mini and highlighted that it was extremely unlikely for Apple to stomach a gross margin below 30%. Based on this fact and the Nexus 7's BOM estimates, I still find it extremely unlikely for an iPad Mini to be priced below $299. In order to maintain a gross margin of 30% at a price point of $249, the iPad Mini would need to have a BOM+Manufacturing cost of $174.30. While, the iPad Mini may contain just 8GB of storage, the higher costs of the aluminium enclosure, larger 7.85 inch display and other more expensive components should more than make up for this, which would ensure a price above $249. In addition to this, it may be unlikely for Apple to introduce a 16GB model of the iPad Mini at $349 (similar to Google's pricing strategy) considering the fact that the 16GB model of the iPad 2 is currently priced at $399. Apple would have to pull the iPad 2 from the market to introduce such a product, which is highly unlikely given product margins. Apple may release a 4G enabled iPad Mini at a higher price point, but given the popularity of WiFi only models, I don't think they would constitute a large proportion of sales. Apple's goal for the iPad Mini is to attract new buyers who may otherwise be swayed by other low cost tablets, while minimizing the cannibalization of sales of existing iPad models. This balance between market expansion and cannibalization may be fairly difficult for Apple in the short term. However, in the long run, an iPad Mini is as essential for Apple as the Nexus 7 is for the Android platform. 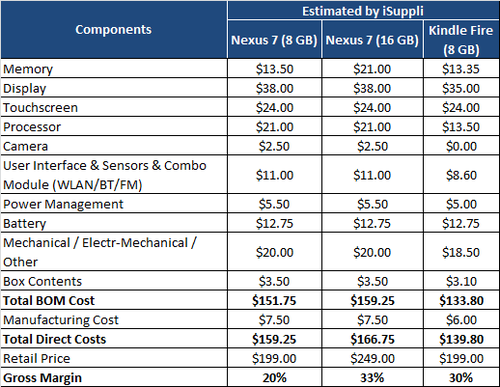 Conclusion - The Nexus 7's BOM estimates ensure modest profitability for Asus and Google without losing sight of their larger goal. However, they also show the challenge Apple faces to bring down prices while maintaining profitability.